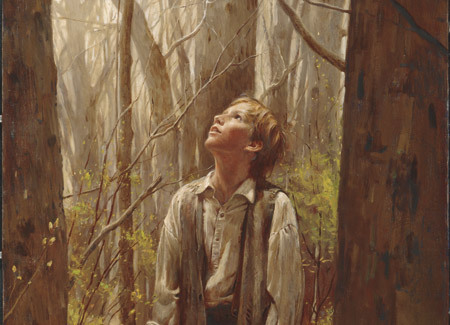 Through the Prophet Joseph Smith, the Lord restored His gospel in its true glory, power, order, and light. “He believed that it was necessary to have prophets, apostles, dreams, visions and revelations in the church of Christ, the same as they had who lived in ancient days; and he believed the Lord would raise up a people and a church, in the last days, with prophets, apostles and all the gifts, powers, and blessings, which it ever contained in any age of the world. … He frequently came to my father’s house when I was a boy, and taught me and my brothers those principles; and I believed him. “[He] prayed a great deal, and he had dreams and visions, and the Lord showed him many things, by visions, which were to come to pass in the last days. “I will here relate one vision, which he related to me. The last time I ever saw him, he said: ‘I was laboring in my field at mid-day when I was enwrapped in a vision. I was placed in the midst of a vast forest of fruit trees: I was very hungry, and walked a long way through the orchard, searching for fruit to eat; but I could not find any in the whole orchard, and I wept because I could not find any fruit. While I stood gazing at the orchard, and wondering why there was no fruit, the trees began to fall to the ground upon every side of me, until there was not one tree standing in the whole orchard; and while I was marveling at the scene, I saw young sprouts start up from the roots of the trees which had fallen, and they opened into young thrifty trees before my eyes. They budded, blossomed, and bare fruit until the trees were loaded with the finest fruit I ever beheld, and I rejoiced to see so much fine fruit. I stepped up to a tree and picked my hands full of fruit, and marveled at its beauty, and as I was about to taste of it the vision closed, and I found myself in the field in the same place I was at the commencement of the vision. “He had this vision about the year 1800, and he related it to me in 1830—the same spring that this Church was organized. When Wilford Woodruff joined the Church, he wrote a letter to his friend Robert Mason. “I … told him I had found the Church of Christ that he had told me about,” he later recalled. “I told him about its organization and the coming forth of the Book of Mormon; that the Church had prophets, apostles, and all the gifts and blessings in it, and that the true fruit of the kingdom and Church of Christ were manifest among the Saints as the Lord had shown him in his vision. He received my letter, and read it over many times, and handled it as he had handled the fruit in the vision; but he was very aged, and soon died. He did not live to see any Elder to administer the ordinances of the Gospel unto him. The gospel of Jesus Christ is everlasting and unchangeable. Jesus Christ established His Church during His mortal ministry, but the people fell into apostasy soon after His death and Resurrection. 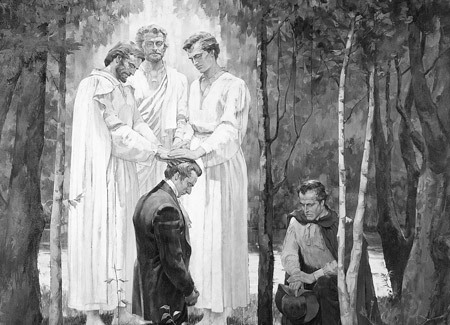 After centuries of apostasy, the Lord restored the fulness of the gospel through the Prophet Joseph Smith. What did Joseph Smith do after having received [the] priesthood and its ordinances? I will tell you what he did. He did that which seventeen centuries and fifty generations, that have passed and gone, of all the clergy and religions of Christendom, and the whole world combined were not able to do—he, although an [unlearned] youth, presented to the world the gospel of Jesus Christ in its fulness, plainness and simplicity, as taught by its Author and his apostles; he presented the church of Jesus Christ and the kingdom of God perfect in their organization, as Paul represents them—with head and feet, arms and hands, every member of the body perfect before heaven and earth [see 1 Corinthians 12:12–28]. How could he, an [unlearned] boy, do that which the whole of the learning of the Christian world for seventeen centuries failed to do? Because he was moved upon by the power of God, he was instructed by those men who, when in the flesh, had preached the same gospel themselves, and in doing this he fulfilled that which Father Adam, Enoch, Moses, Elias, Isaiah, Jeremiah and Jesus and his apostles all prophesied about. Well might Paul say—“I am not ashamed of the gospel of Christ, for it is the power of God unto salvation unto every one that believes.” [See Romans 1:16.] So may the Latter-day Saints say—“We are not ashamed of the gospel of Christ.” I am not ashamed to say that Joseph Smith was a prophet of God; I am not ashamed to bear record that he was called of God, and laid the foundation of this church and kingdom on the earth, for this is true, and any man or woman who is inspired by the Holy Ghost can see and understand these things. We now have the privilege of walking in the light of the restored gospel. As I reflect … upon the condition of the human family, and consider how differently we are situated from the masses of mankind, I do feel that we ought to be grateful to our great Benefactor. There are millions of the human family who assemble in various houses, in cathedrals, churches and chapels, for the purpose of worshipping God, but is there one of those numerous congregations who come together with an understanding of the truth, except there be some Latter-day Saint Elder who is called to preach to the inhabitants of the earth? Do they come together understanding the principles of the same gospel, the same plan of salvation, the gospel of Jesus Christ, in a way and manner to make them one? Now, God could not make a people one with so many kinds of faith, and such a multiplicity of doctrines, diametrically opposed to each other, as exist in the world, but we are a blessed people; we have the principles of union and oneness with us, and by carrying them out they bind us together and make us one. Where is the man or woman that comprehended anything about God or about eternity until Joseph Smith revealed the fullness of the gospel? I could read of those things in the Bible which we now believe in and receive, but I was surrounded by the traditions of the world and could not comprehend them. Consider these ideas as you study the chapter or as you prepare to teach. For additional help, see pages v–ix. Review the story on pages 1–3. What was missing from Robert Mason’s life? What does this account teach about the Great Apostasy and the Restoration of the gospel? Study pages 3–5, looking for characteristics of the Lord’s true Church. Why is it important that the Church always be established according to the same pattern? According to President Woodruff, what led to the Great Apostasy? What were some results of the Great Apostasy? (See pages 4–5.) How are these results evident today? Review pages 5–8, looking for some of the accomplishments of the Prophet Joseph Smith in the Restoration of the gospel. How have his accomplishments influenced your life? Read the statement that begins at the bottom of page 6. How can we show that we are not ashamed of the restored gospel of Jesus Christ? Note the words darkness and light on pages 8–10. What do you learn from President Woodruff’s use of these words? What would be missing from your life if you had not embraced the restored gospel? “Leaves from My Journal,” Millennial Star, May 23, 1881, 334–35. Deseret News: Semi-Weekly, July 1, 1866, 2. The Discourses of Wilford Woodruff, sel. G. Homer Durham (1946), 24. Deseret News: Semi-Weekly, January 12, 1875, 1. “The Faith of the Latter-day Saints,” Millennial Star, July 25, 1892, 478. Deseret News: Semi-Weekly, June 13, 1882, 1. Deseret News, March 21, 1855, 10. Deseret Weekly, November 14, 1891, 658. Deseret News, September 26, 1860, 234. Deseret News: Semi-Weekly, November 25, 1873, 1. “Discourse by President Wilford Woodruff,” Millennial Star, May 21, 1894, 324–25. Deseret News, December 26, 1860, 338. Deseret News, January 6, 1858, 350. Deseret News: Semi-Weekly, December 28, 1875, 1.